Nearly, 66 percent of all student loans are federally subsidized. American students can’t afford college tuition, and they turn to the federal government who offers them loans, regardless of whether it is makes financial sense for them. This bill will help address the rising cost of education by incentivizing savings and providing individuals the tools to combat the high cost of education without relying totally on government assistance. Expanding contribution limits on Coverdell Education Savings Accounts from $2,000 to $10,000 will allow families and students to save more tax-free money that can be used on tuition, books, and other educational expenses. The cost of college tuition has more than quadrupled since the Department of Education was established. With the federal government offering easy credit to students who assume that it must be a good investment, it is inevitable that college tuition will continue to increase rapidly. The federal government adversely influences the market and has increased the cost of college tuition over the years. 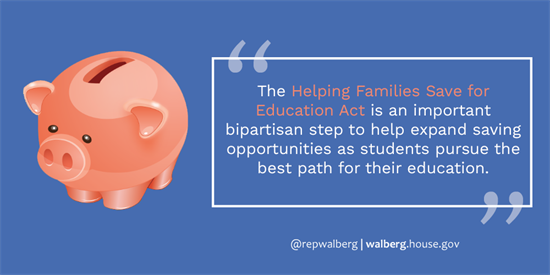 This bill will make college more affordable by encouraging students and families to save through education savings accounts. By increasing the age from 18 to 22 in which contributions to a savings account can be made this bill will allow students to save while in school. It is imperative that we allow students to save for their futures and create even more options to pursue higher education. Education savings accounts are a no-brainer and a step in the right direction. HostGator is a web hosting provider which is owned by Endurance International Group (the same company which owns Bluehost).